Did you enjoy Quiet Book week? Which page was your favourite? I thought for reference I'd make a summary post so all of the different pages, with their templates are really easy to find. Here are photos to remind you of the different pages, including a link to each page. The download-able templates are included below. And here are your templates, all in one place, ready to download. And here is the file I created that includes all of the titles and references. There is a Microsoft Word version if you want to make changes or a PDF version if that's easier for you to work with. I printed it out and placed it behind my white fabric then lightly traced the text with a pencil. Using that as my pattern I stitched the words. 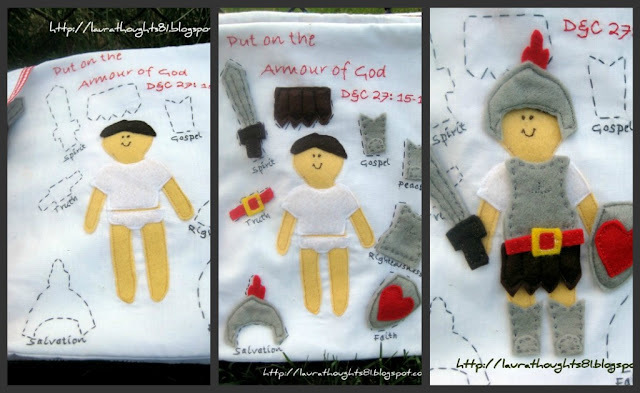 For the Armour of God page I included the spelling variation (skipping the 'u') and I also included the Bible reference rather than the Book of Mormon one. 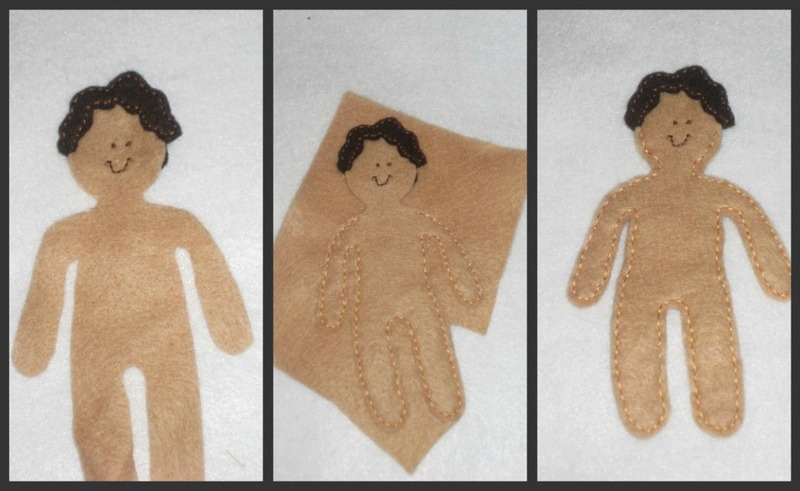 If you make your own versions using my templates I'd love to see them, send me pictures! And if you want to see the non scripture pages I completed in the past you can use the links below. I think Johan was my favourite. Time to get Quiet Booking again! Bryn needs more than just one page. Thanks for the templates. So, that was Jonah, not Johan. Oops! This is wonderful! Thank you sooo much for sharing. My children are going tolove this!!!! Wow...these are incredible! I have been seeing alot of posts about Quiet Books lately...and I LOVE yours! Our company's name is Arma Dei, latin for Armor of God, so I LOVE the Armor of God page! Wow! I have linked to your pages...on 2 different linkies on my blog...hope that's ok! Do you sew the templates first to another layer of felt and then cut them out! Brilliant! This will definitely keep me quiet during Sacrament. That is a really neat book! I love all the scripture in it--makes it a perfect pairing for church! Do you sell them? Wow. That is so cool. I can't wait to try one of these. You are amazing! I have been slowly sewing a quiet book for my daughter and these will some in so handy! The favorite page I have made so far is a getting ready for church page. It's a boy's button up shirt from Walmart cut like a tuxedo front and tacked down with a bolo, bow and a normal tie to practice with! (of course underneath the button up shirt is a superman logo, I'm a Superman fanatic). Wow! This looks amazing, what a great job! Love this! You did such a great job!! Would you like to share this post at our Weekly Playdate link party? It would be a fantastic addition! Oh my goodness! 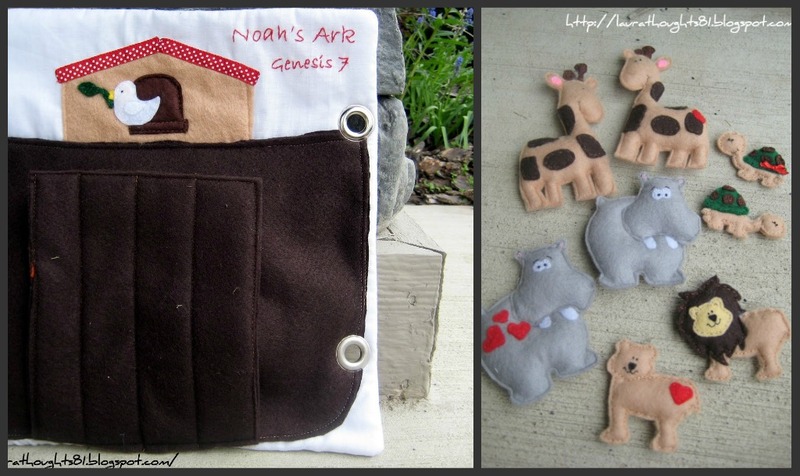 That Noah's Ark is too cute! Love those animals! And Jonah is fabulous too! lol Thanks for linking up to this week's Catch a Glimpse party! I'd love for you to share it at my link party. Wow! How precious these will be for your children! I think these would definitely sell!!! Oh, thank you for this! I have a new great-granddaughter and I'm going to make this for her! It's just wonderful! Very cool quiet book! I'm kind of a quiet book fanatic so I love to see new ones out in Blogland. I may have to try making a tree of life page...don't know why I hadn't thought of that one! So cute! Thanks for sharing! I love this. It is so hard for me to keep my 3yr old and 2yr old busy in sacrament. This is perfect. 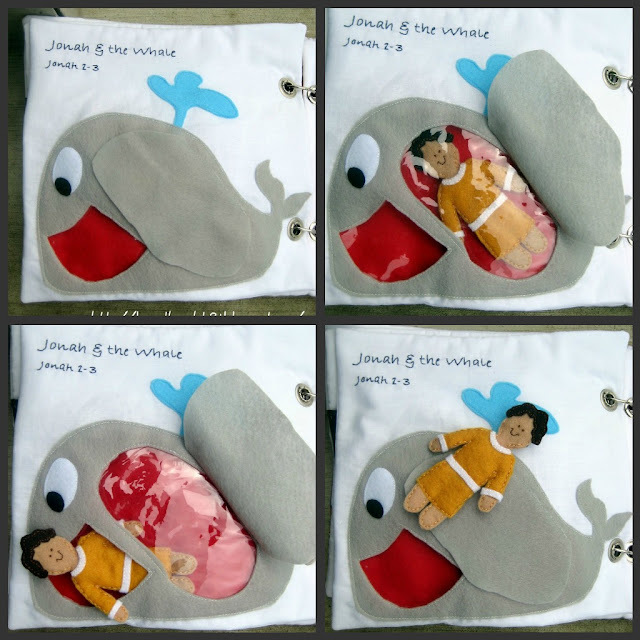 I love the armor of God and Jonah and the Whale. Thank you for sharing. What cute ideas! Thanks for sharing! thank you, thank you, thank you!! 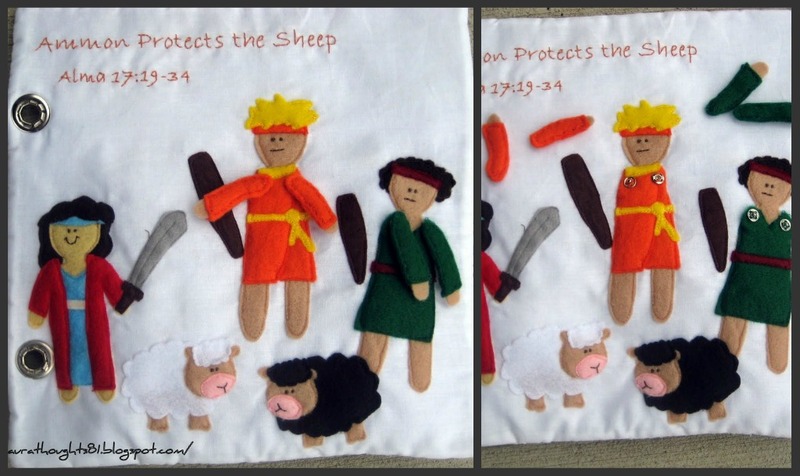 I've been trying to think of some ways to make scripture stories into a qiuet book and couldn't think of any! These are absolutely amazing. AWESOME job!! I LOVE this! 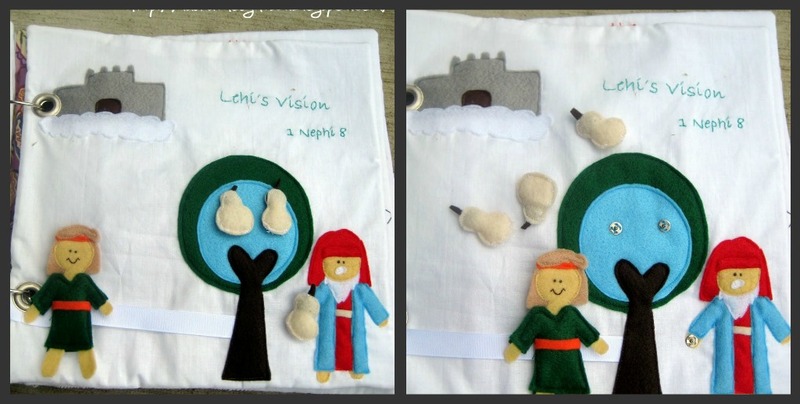 I will probably make one for my kiddo's for Christmas-just add it to my ever growing list! oh my gosh! THANK YOU, THANK YOU, THANK YOU!! These pages are going to be PERFECT in the quiet book I want to make my duaghter for Christmas!! You did a great job! This is just adorable! I love that it is things from the scriptures. 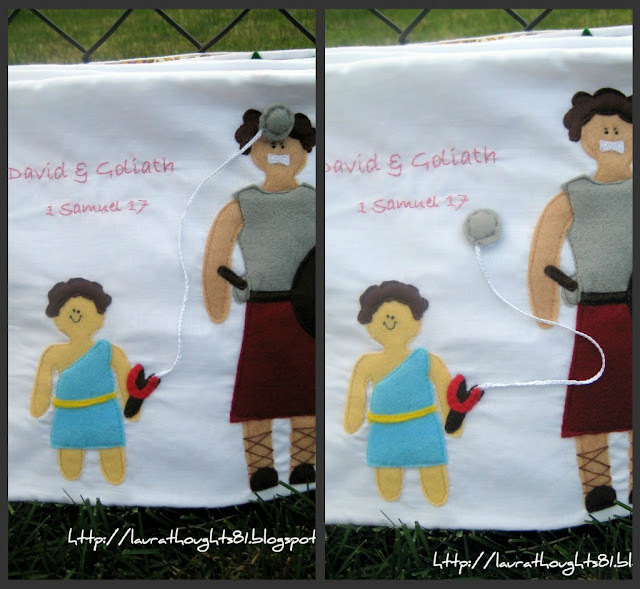 Thanks so much for sharing I am totally going to make this for my kids. They already have 3. :) But totally need one more.... right? This is the CUTEST thing EVER! Thank you so much for sharing it. Hopefully I can motivate myself enough to make one of my own. Love it! I love this and would be interested in buying one since I don't sew, would you consider? Tasha, I tried to email you but your email isn't attached to your profile. It's been so long since you left this comment you may not get my response and I apologize but I'll leave this just in case. I'm so glad you love my quiet book and I would be willing to make one for you. I spend a ton of time on these doing a lot of hand sewing and a lot of customization, plus it would take me a while to put together so they're not cheap but here's what I'd charge. I would sell a book with 10 pages for $80 dollars plus shipping. My book has 14 pages so you would have to choose which pages you were interested in. I would be willing to add more pages if you want for $10 for each additional page. That's probably far more than you want to spend but if not let me know and we can work out the details. Thank you Laura! I will consider this, let me talk to my husband tonight. What or where can I see the page options? Also, I am unfamiliar with the scriptures as you have them written, could they be from KJV? Thanks again, I'll get back to you. It starts out with the scripture ones and then there are others below. Some of the scriptures are from the King James Version of the Bible but some of them are also from the Book of Mormon. I just came across your blog. Wow!! Fantastic work! I LOVE that they are all Bible stories. Thanks so much for sharing. Thank you for sharing your wonderful talent so that I can share it with the little ones in my family! Bless You! Just wanted to say a HUGE thank you for sharing all your patterns and tips! I just made a quiet book for my nephew and would have been totally lost without your advice and patterns! If you'd like to see how mine turned out, I posted it on my blog at http://gingerjarr.blogspot.com/2012/09/shhhhhh-quiet-book.html. Again, thank you for sharing!! I just wanted to thank you fervently for posting such wonderful templates. I used almost every single one! I am in the process of posting my Quiet book as we speak if you'd like to come and check it out. I will be linking back to your blog so others can see where the original masterpiece was created. Thanks for sharing! These are adorable. I love the Jonah page. So fun, so creative. I LOVE the Ammon page, it's so funny!!! The following page should feature King Lamoni with a sack (so the arms can be moved into the sack). That would be hilarious. I really need to make this for my future kids! These are so cute. Thanks for sharing the templates! How do you do the eyes/mouth ect? Are they just drawn on? I LOVE This! I'm so excited to get to work on this for my daughter! Thank you thank you thank you! I love this quite book. It's amazing. I'm doing a post on my site, Meaningful Mama, and I'm hoping I can use a photo and link back to your site. If there is a problem with this, let me know. I find most people like the traffic, but I want to make sure it's OK. Please let me know if it is not OK. Otherwise, I'll proceed forward. Thanks. Great job!! Thank you very much for the great idea. We did whale and Jonah on a Saturday school for children. Surely the kids will love.